I had to scrape ice off the car windshield yesterday morning. All the Halloween candy has been eaten. It’s dark when I leave for work in the morning, and dark when I get home. I only have two more episodes to go in Stranger Things 2. I’m tryna figure out what to make for Thanksgiving. What’s all that mean? It means Vintage Science Fiction Month is almost here! If none of this makes any sense to you, here’s a good post that explains it. Here’s a ginormous list of a zillion Vintage reviews that were done in conjunction with #VintageSciFiMonth. 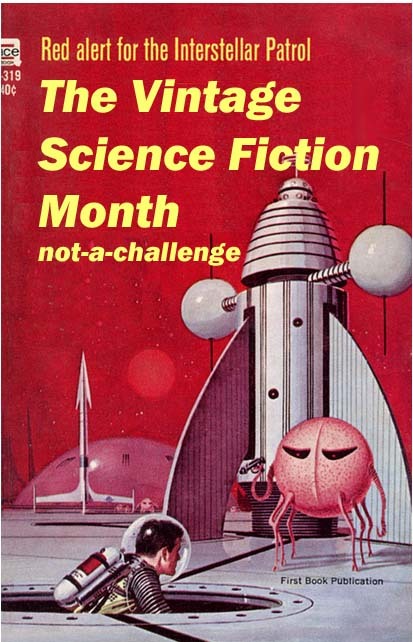 Thanks to Vintage Science Fiction month, I discovered Cordwainer Smith, Andre Norton, Edmund Hamilton, Samuel Delany, Joan Vinge, Kate Wilhelm, tons of fun Star Trek short stories, Hal Clement, the cheesy goodness that is Space 1999, and so much more. I’m reading it all out of order, and completely out of context, and having a blast. What can you look forward to this January? Rumor has it there will be a Dune read along, possibly a live tweeting of the 1984 Dune movie, Cover art posts, how and where to find Vintage scifi, and I’m sure there will be Blind Dates with a Vintage Book. You know, all the good stuff you’ve come to expect! Are you interested in writing a guest post for Vintage Month? guest posts can be anything from a review of a Vintage book you read, to the old scifi short story magazines, to talking about an older scifi movie or TV show you like, to just about anything Vintage Scifi-ish. Are you interested in hosting a guest post for Vintage month? Sound off in the comments below, and I will do my best to connect people who want to write a guest post to people who want to host one. 22 Responses to "The Vintage Science Fiction Must Flow"
Join us for Vintage Science Fiction Month in January! I did it last year, and it was a lot of fun. 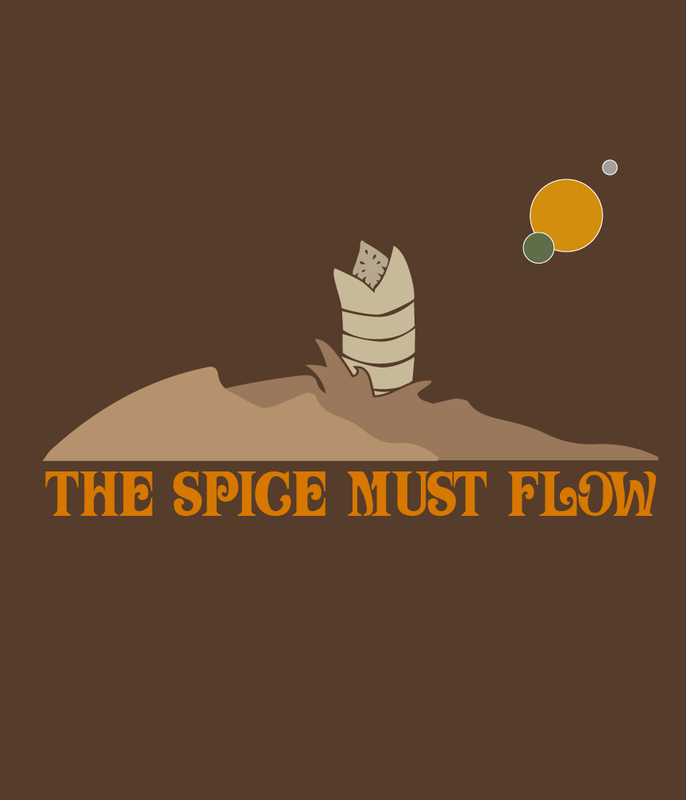 I think I will participate in the re-read and watch of Dune this year, and maybe I will read and review a Heinlein and some Northwest Smith. Definitely interested – either to write up a review or host. The Dune livetweet sounds like fun too! You got it! when the time gets closer, I’ll e-mail you about hosting a guest post. Oooh. I would love to host and/or write a post for this. Is it strictly sci-fi, though? Or is fantasy included as well? We would be interested! We can do a review of some vintage sci-fi. Hi Mr and Mrs NW! Would love to have you review any science fiction from 1979 or earlier! Vintage SciFi Month is pretty much a free for all good time. I would love to do a blog post about cyberpunk: either a review of a cyberpunk book or an overview of the genre. That would be fantastic! I’ll e-mail you when the time gets closer. I’m finally going to be able to participate in #VintageSciFiMonth! 🙂 I’ve wanted to join you for at least four years now — I spied the #ReadDune and felt it was kismet since we just talked about this during #RRSciFiMonth! Also, do you know if the #SciFiExperience is being hosted this year? Reason being – I finally have a solid line-up of books I’m reading over Dec/Jan but if the event is on hiatus, I’ll just use my own tag #FuellYourSciFi instead. Either way, I wanted to say I’m wicked happy I can start participating – I love reading your event posts each year and now I can finally start reading books pub’d 39+ years ago!! It will be nice to start digging into the origins of SciFi! There is a post I’m thinking of composing for my blog – about trying to sort out the grandfathers + grandmothers of the genre whilst trying to aim for a co-balance of old/new voices of the genre — however, if someone wanted to pitch a topic to me which correlates with Hard Sci Fi origins or something related to Classic #SpaceOpera, I’d entertain hosting them! This is sort of the direction I’m interested in at the moment – other topics I’ll consider too – send them over to me – either DM on Twitter or I have a Contact Page on my blog. I’ll definitely join in on this with Reading & Reviews! I grew up on Vintage SciFi (and Horror) and Gothic–back when some of it was contemporary, not Vintage:). I’m ready to join in again. Preparing to read four more books (yet-to-be-determined). In terms of reading vintage science fiction, I highly recommend the works of Ray Bradbury, Arthur C. Clark, and Isacc Asimov from the 1950s. There work has really withstood the test of time. Some of it has also been prophetic.